My last day of work before breaking for my holiday ended up being two hours longer than usual, and by the time I got home it was dark and cold (almost like winter again!) I took a stroll down to the jetty after dinner, Nex 5N and tripod in hand. If one shoots cameras as a form of relaxation, shooting night images must be the ultimate in unwind. A single exposure might run into the minutes. All you can do is sit and wait, or count, breathing slow and relaxed as you take in the surrounding environment. I also like how you are gathering not just a split second of time into one image, but minutes of time, all frozen into one picture…a time capsule in a photographic sense. 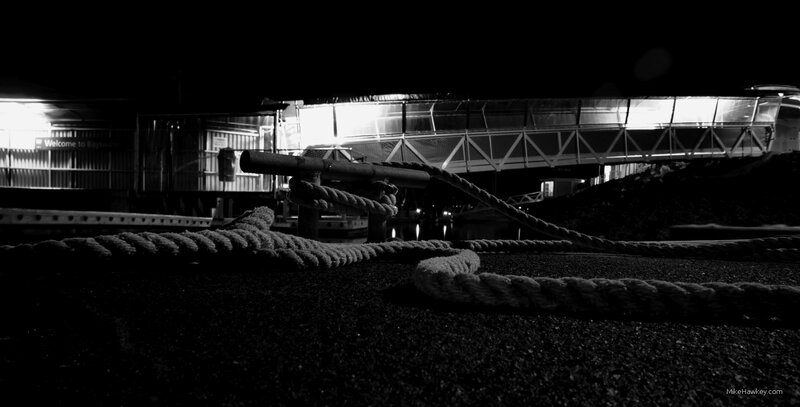 Today’s image, ‘Rope by the Shore’ also happened to be my quickest exposure of the night at 52seconds @ 100iso. Breaking my usual practice of capturing the appealing light of the night, I converted today’s image to B&W with Gimp, pushing the contrast slightly, as I often do with my images. I cropped it, giving a wider aspect, and resized for the net.